← John Milliken Thompson. Love and Lament. New York: Random House, 2013. Bennett Madison. September Girls. New York: HarperTeen, 2013. Seventeen-year old Sam isn’t excited by his dad’s resolution to spend the summer at a quiet little beach town on the Outer Banks, but he isn’t surprised by the scheme either. Earlier that winter Sam’s mother dropped all her responsibilities and abandoned her husband and her son to spend time at Women’s Land, which the book implies is something of a feminist commune. Prior to her departure, Sam’s mother, a “frumpy kindergarten teacher,” adopted radical feminist tenants, like the SCUM Manifesto, so the act is something of personal (or self-satisfying) liberation for her. Sam’s dad has dealt with the change by throwing himself into hobbies from yoga to knitting to cooking. Sam jokes “if there was a tear-off sheet on a bulletin board in Starbucks he was willing to give it a try.” So his latest idea to relocate temporarily to the Outer Banks is one of many distractions from the reality of his wife’s abandonment. Jeff, Sam’s brother, has returned from college recently and helps somewhat to plug the hole left by their mother. With Jeff and Sam in tow, their father packs everything up and heads for the beach, even before Sam’s school year ends. After several months of dealing with his fragile father and pressure from his friends–and now Jeff– to “man up” and “get laid,” Sam wants to escape. He is troubled by ideas of love and manhood. The men in his life don’t exactly provide a shining paragon of masculinity. But soon Sam’s attention is diverted by another presence on at the beach, the Girls. They are blonde and beautiful and, to Sam, interchangeable. Sam watches them working menial summer jobs around town, taking cigarette breaks, flipping through magazines, lying on the beach. Yet the strangest part is not that the Girls are everywhere, but that they are all interested in Sam. They eye him with a lustful hunger. Sam is befuddled that the Girls notice him rather than his hunky brother, or any other hunky guy around the town for that matter. He is scrawny and awkward, hardly a chick magnet. Then he meets one of the Girls, DeeDee. Normally they travel in pairs, but DeeDee seems different from the rest of the Girls. She and Sam bond, and he feels genuine affection for her. But she hesitates. There is a mystery of an otherworldly nature surrounding her and the rest of the Girls. When Sam learns the truth behind the secret, it alters his relationship with DeeDee irreparably. Novelist Bennett Madison captures pitch-perfect the crude exchanges between Sam, Jeff, and their father, and Sam’s constant cynicism sounds like a teenager attempting jaded and world-weary angst. 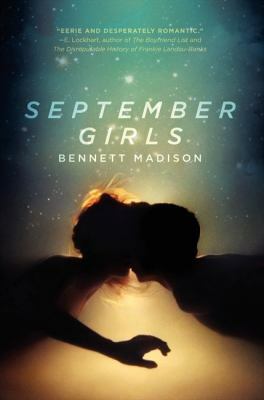 Madison structures the novel traditionally and from Sam’s perspective with numbered chapters, but he weaves in parallel chapters from the Girls with named chapters. The interspersed chapters from the Girls read like an echo and function similarly to a Greek chorus, summarizing background information and responding to and supplementing the story’s action. These chapters also successfully bolster the mythic quality of the story. However, Madison maintains a clean balance between the fairy tale and the reality. Madison’s treatment of Sam and his story is based the development of a boy tripping around the edge of manhood and a confused family trying to mend life’s rips and holes.